It’s easy to get stuck in negative thoughts and feelings about yourself when you go trough a tough time like stress, lack of energy, anxiety or feeling depressed. Mindfit helps you change your thought pattern and reduce negative thoughts by being more aware of the positive things happening in your life right now. Using proven methods and techniques, you will be guided to a better life – whether it’s about coping with stress, anxiety, depression or training yourself to improve your self esteem and sense of achievement. Mindfit helps users to be aware of their problem areas, and gain insight into what prevents them from changing their situation, in part by becoming aware of how you react when facing a challenge. We know from experience that change involves both ups and downs, and Mindfit offers different tools and techniques that can be helpful when challenges arise. 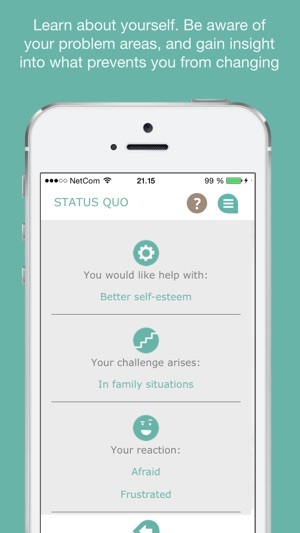 Mindfit is designed so that it simulates some of the issues and techniques a therapist would use in his or her first meeting with an individual seeking help. The tool is inspired by well-recognized treatments such as cognitive therapy, positive psychology and EMDR, but also by the more general communication and therapy techniques used in psychology. Change is not just about setting goals for yourself, but also about what you can do to keep motivated to continue. During the process of change habits, it is often easy to forget all the little things you have actually achieved on the way towards your big goal. Research shows that being grateful is good for your health, promotes well-being, increases happiness and reduces depression. This is one of many reasons why we have developed Mindfit. We recommend that you record the positive events in your life and your feelings of mastery along the way - to reduce stress, anxiety, depression and negative thoughts to keep your mind happy. OUR CUSTOMERS LIKES US because we helps them to achieve a better everyday life. 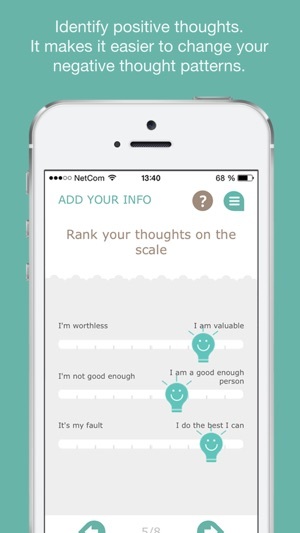 "This app is by far the best tracker for you to reflect on when you're not feeling at your best, to show you your worth and boost your confidence day by day. 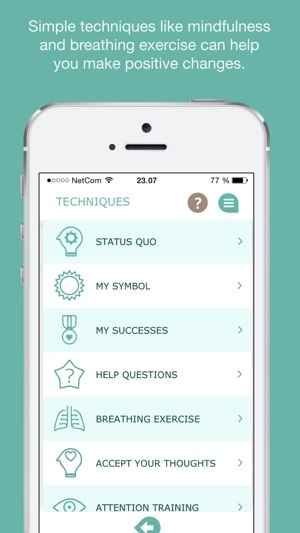 "As someone who suffers from anxiety and confidence issues, this app has helped me realise my potential and has great techniques to relax and become more mindful"
* A number of psychologists in Norway recommend Mindfit! Here you identify situations, feelings and thoughts so that you become more aware of how you react when facing a challenge. How you choose to see yourself, and your belief that you can learn to cope, will affect the way you react to situations. Shifting your focus to situations that you have mastered will help you address your challenges and helps you to reduce negative thoughts to a greater sense of mastery and positive thoughts about yourself. Here we have collected various techniques (mindfulness, breathing / relaxation exercises and attention training) you can use when you are in a challenging situation. 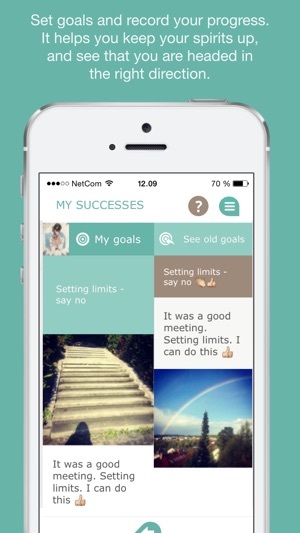 Mindfit is a self-help app that focuses on mental health training, and the app is intended as a way to help you to help yourself! Mindfit does not collect personal information about you as a user of this app. All the information that you record is stored only on your mobile phone. Totally not worth the money I spend. This is a nice app. But it is NOT worth the three dollars I paid for it. 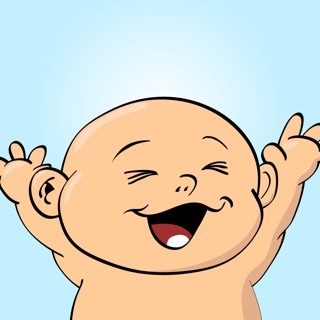 Basically, this app is made to record the happy things in your day, you can take photos and write a description as well how the experience made you feel. However, the description implies that you'll have a tool kit of helpful exercises to help you get through tough situations. Wrong. As someone who suffers from anxiety and depression I was looking forward to paying for what this app was offering. But there are only 5 "techniques" which are a breathing exercise (a basic in through your nose 4, hold two, out your mouth 4), "help questions" which is basically "what would your friend tell you if they were here/what would you tell your friend if they felt this way", "accept your thoughts" which is just putting your thoughts into clouds, knowing they're there and accepting them, and attention training. All you do in this is focus on three things and try to relax. There is also a relax exercise that all you do is clench and unclench your fists. The "techniques" never change. After having an anxious day I found none of these helpful and was really frustrated to find that accept your thoughts was just pretending they were in clouds. I felt this app was lacking in the hopes I had for it. I would not have spent three dollars on it. I love having all of the things that made me happy in the day in one happy place to see but that's all this app is doing for me. Sorry mindfit. Helped me break spirals of negativity and depression by making me focus on small daily accomplishments rather than my problems and failures. You have to log things and be truthful for it to work, but I found it to be a good building block towards mental stability and happiness.